TGIF, fellow crafters! 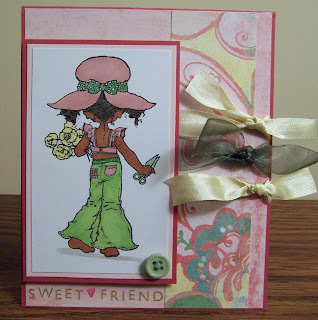 My card, today, features an adorable stamp by Sarah Kay called Spring Blossoms. Isn't she adorable? I love the big hat and fashionable outfit. I didn't have a difficult time choosing the color scheme for this image as the pink and green color combination seemed a natural fit. I can imagine a five or six-year girl wearing an outfit just like this one. The elements I used include various Copic markers to color the image, the sentiment is a rub-on from K&Company, SU cardstock provides the base of the card, and the patterned paper is by Basic Grey. I'm not sure who the ribbon is by since they were gifts. Oh, and the button is actually a brad--ya gotta love that idea! Quick and easy embellishments are always in season. Enjoy your day and keep on crafting! Oh I like this. You know I've been making lots of pink and green cards lately. This is adorable...such pretty colors and your coloring is gorgeous!!! My DD had an outfit just like this one many years ago! !